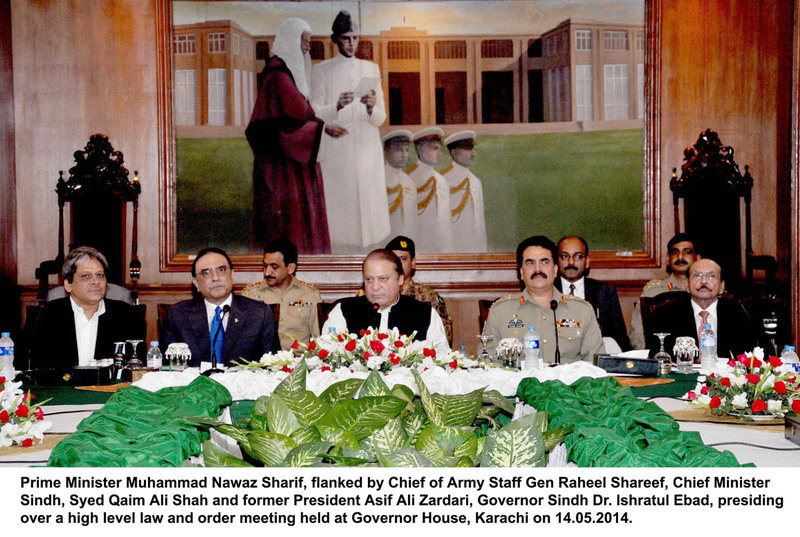 Prime Minister Muhammad Nawaz Sharif chaired a high level meeting regarding Law & Order at Karachi today. The meeting was also attended by Former President Mr. Asif Ali Zardari, Governor Sind Dr. Ishrat-ul-Ebad Khan, Chief Minister Sind Syed Qaim Ali Shah, Federal Interior Minister Chaudhry Nisar Ali Khan, Army Chief General Raheel Sharif, ANP Senator Shahi Syed, Ex-MNA MQM Syed Haider Abbas Rizvi, Secretary General Jamat-e-Islami Mr. Liaqat Baloch, DG ISI Lt. General Zaheer-ul-Islam, Corps Commander Karachi Lt. General Sajjad Ghani, Secretary to PM Mr. Javaid Aslam, Chief Secretary Sind Mr. Sajjad Saleem Hotiana, Federal Secretary Interior Mr. Shahid Khan, Federal Secreatary Law Mr. Zafar Ullah Khan, Director General Intelligence Bureau Mr. Aftab Sultan, DG Rangers Sind Maj. General Rizwan Akhtar, DG ISPR Maj. General Asim Saleem Bajwa, Acting IG Police Sind Mr. Ghulam Haider Jamali, CCPO Karachi Mr. Shahid Hayat, Commissioner Karachi Mr. Shoaib Ahmad Siddiqui and senior officers. Prime Minister Muhammad Nawaz Sharif apprised the participants about Federal Government’s efforts towards restoring peace in Karachi and reiterated that improvement in law and order should be above politics. PM further said that terrorists and criminals should be brought to justice without any political prejudice. “We started operation in Karachi with the agreement of all political parties and stakeholders”, said the Prime Minister. 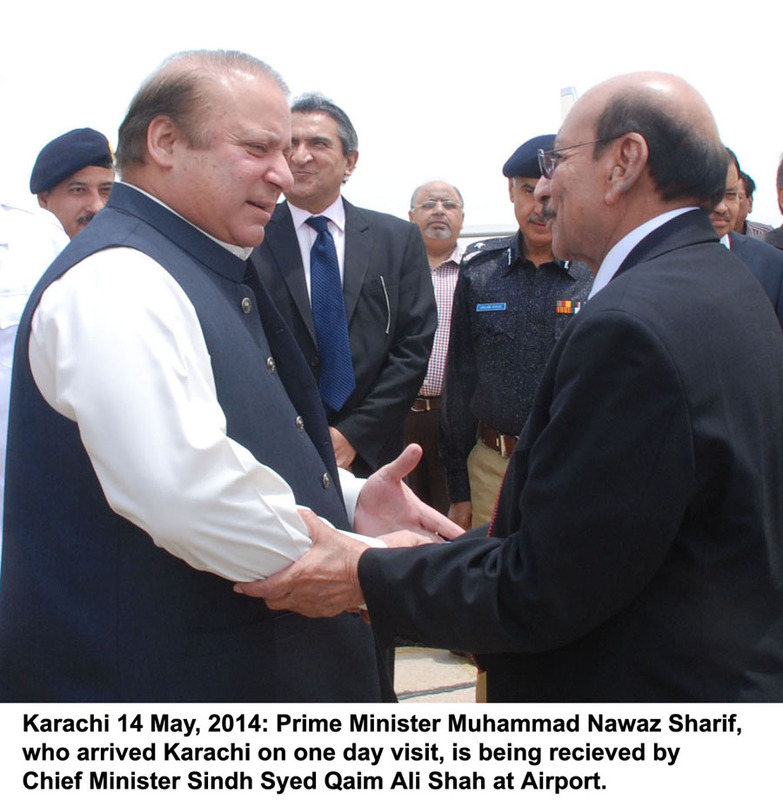 Prime Minister said that Karachi holds special significance for him, being the economic hub of Pakistan. “We want cooperation of all stakeholders in Karachi and I see no one who will not want to improve the law & order situation of Karachi, therefore, a joint solution is the only option”, said the Prime Minister. Prime Minister emphasized upon capacity building of Sindh Police and appreciated acquisition of services of retired army personnel for maintaining law and order in Karachi. Prime Minister said that it is very natural that there will be retaliation from extremists and terrorists, but the government is prepared for that and all possible support will be provided to law enforcement agencies to counter the retaliation. Prime Minister directed to constitute special committees to address any kind of hurdles or grievance being faced in the Karachi operation. Prime Minister reiterated that the present government implemented Pakistan Protection Ordinance with a view to deal with the menace of terrorism and bring criminals to justice. Federal Interior Minister Chaudhry Nisar Ali Khan briefed the meeting that state-of-the art equipment is being provided to law enforcement agencies and about Seven Hundred Thousand illegal mobile SIMS have been cancelled. He further elaborated that once 3G mobile technology is in place, we will further carry out crackdown against illegal SIMS. Chief of the Army Staff General Raheel Sharif said that Pak Army is ready to provide any kind of support to the Federal and Provincial Governments with hundred percent honesty and sincerity. “We will give our honest opinion and assistance whenever sought from us”, said the Army Chief. He also suggested that posting & transfers of Police personnel should be depoliticised and also stressed upon the need to equip them with modern equipment and resources. Former President Mr. Asif Ali Zardari said that Sind Police needs to be equipped with resources. He further said that support from all political parties is need of the hour to bring peace in Karachi. Chief Capital Police Officer Karachi briefed the participants that closure of illegal SIM will reduce crime by 50% and also assured that police is acting against criminals without discrimination and that there was no political pressure on Police.